Although a gun safe or gun cabinet is designed to protect your gun against possible dangers, a safe will not store your firearms as effectively as you expect. 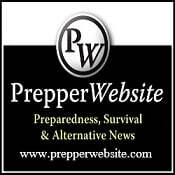 Perhaps your constant hoarding has caused a lot of stuff to be congested in your gun safe than you would prefer, or seeing the guns at the back became difficult. Or maybe, your safe has no lights or may have insufficient lighting. Whichever, there are accessories for your gun safe that will take it to the next level. Below are some of the useful gun safe accessories that you might want to get. The SPAL-300 is a battery operated Led directional light that will brighten up the inside of you gun safe or security cabinet. It features a Motion Detection setting that makes this accessory light up automatically when safe is opened and goes off automatically when closed. 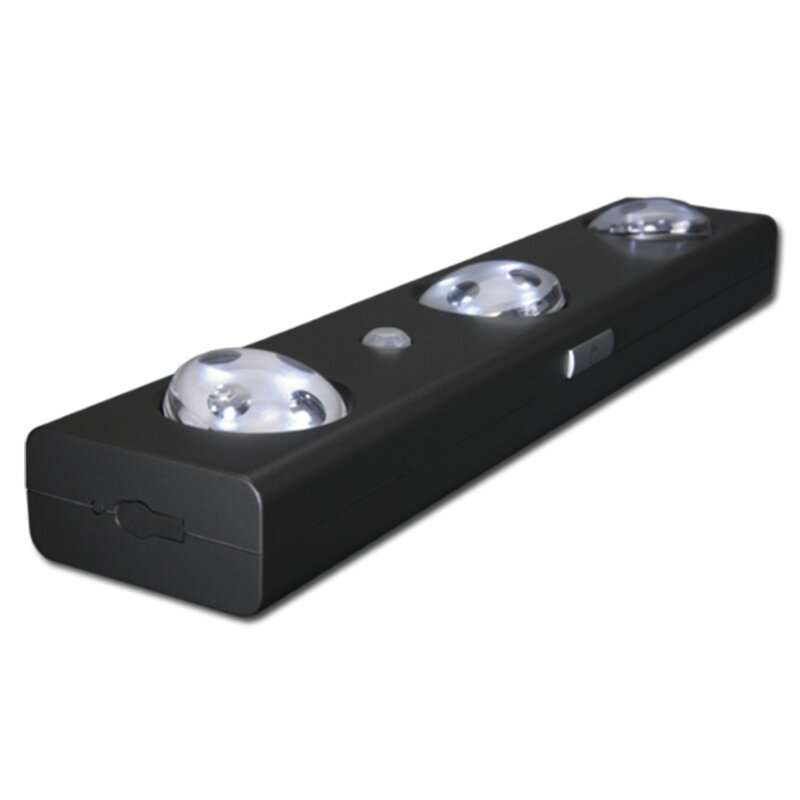 The SPAL-300 has three light heads – each head has 4 LED lights – that can rotate for directional lighting. The manual on/off switch has two brightness levels. Since the SPAL-300 is battery operated, it requires no wiring at all. It will run with 6 AAA batteries which you have to purchase separately. Battery will run for more or less 200 hours(their claim). This LED directional light measures 11-3/4”Width x 2-1/4”Diameter x 1-1/2”Height and weighs 3.25 lbs. Designed for gun safe and security cabinets, the SPAD-100 dehumidifier will absorb excess moisture minus the drilling holes or running electrical cords through your gun safe. Batteries are not even necessary. 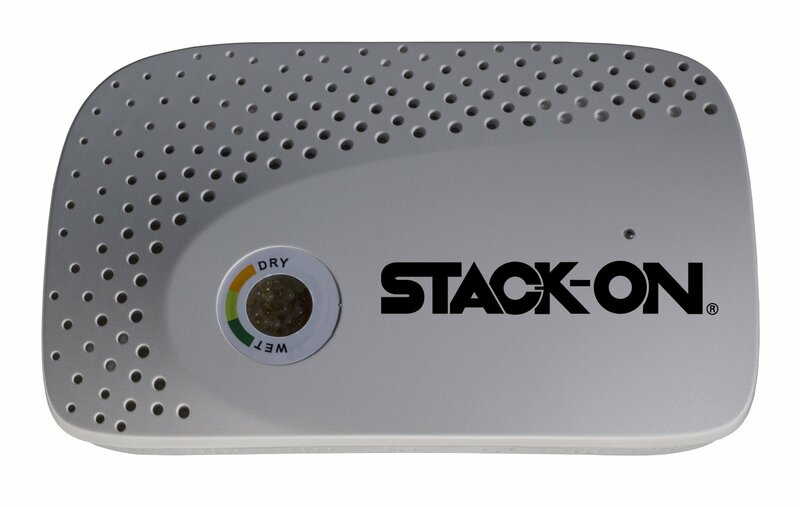 This dehumidifier’s moisture gauge on front has an indicator when it needs to be recharged. The SPAD-100 can absorb moisture from 100 cubic feet and then needs to be plugged in after 4 – 6 weeks. This cordless dehumidifier measure 8.8”W x 2.88” D x 8.13” H and weighs 8.40 lbs. From customers who purchased this product, the charging time is 24 hours and running time is 1 month. It comes in a neat white design which adds to a clutter-free feel. Designed for Stack-On Long-Gun Cabinets, the SPAO-148 small fabric organizer can free up fair amount of space in your gun safe, allowing better usage of shelf space. It can be installed on the back panel of your cabinet’s door. It can hold up some extra mags or ammo, along with various knives, protective eyewear and handheld radio, but might come loose or fall off if you put heavy equipment in it. To secure the organizer better, you can install a pair of screws in the corners on top to avoid drooping inward. The SPAO-148 has mesh pockets which provide durability and enable you to see what’s in the pocket without the need to dig through it. We give the stack on spao a 3.7/5.0 as some had issues with it falling off. Thinking of it built with Velcro, it is advised to make sure there is not much weight put into it, so loading it with too much of heavy stuff is discouraged. Or better yet, secure it with screws or glue gun. Ideal for storing ammo, pistols, supplies and valuables, the Stack-On GCG-900 Steel Cabinet features assembled, steel box built and high quality all-steel, 3-point locking mechanism with double plated lock with key code. The locking system goes by a steel door and is safeguarded behind the steel door enclosure for additional security. The GCG-900 has two removable shelves for enough storage with foam cushioned bottom. 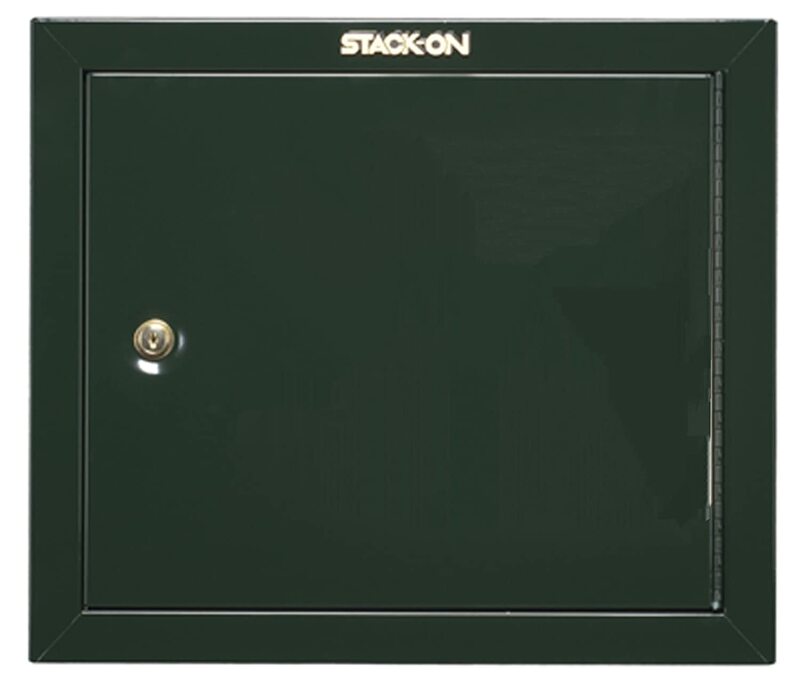 The Stack-On GCG-900 Steel Pistol/Ammo Cabinet features a patented, shaped barrel standoffs and barrel rest for scoped rifles. This steel box also has pre-drilled mounting holes for simpler installation to your gun safe, floor, wall or ceiling. Dimensions are W 53 cm x D 25 cm x H 46 cm and weighs 25 lbs. It comes with color green only. Small and handy, the Stack-On SPAD-24 Safe ‘N Dry Desiccant is ideal for ammo cans to keep your ammo from moisture. It absorbs moisture from the air and can be placed anywhere. This desiccant is sold online for quite cheap for a pack of 4. 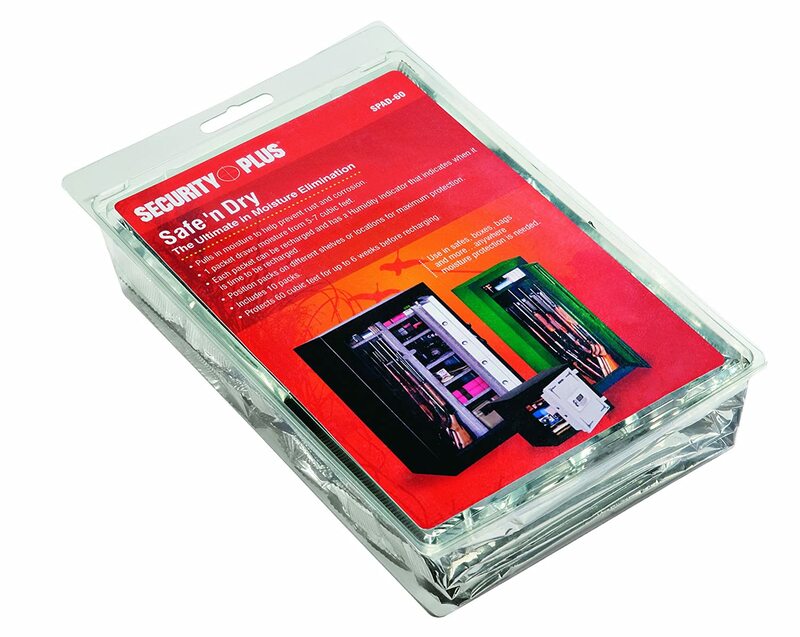 Each packet is separately encased in a foil pouch to avoid activation of desiccant. When the pack is opened, it pulls moisture from 5 to 7 cubic feet. The SPAD-24 is rechargeable using a vented oven at 200 °F for three hours. Every single packet has a handy moisture indicator that signals when you need to recharge the packet. It can be charged 3 – 4 times before its moisture absorbing characteristics will be lost.